The above are lyrics to an African hymn that a priest in our diocese, who was transferred from Nigeria, sings during Mass when he talks about devotion to our Mother Mary. A few nights ago I turned on the TV and a local Christian station was on with some protestant preacher accusing Catholics of divinizing Mary, worshiping her and making her equal to God. This is why it is important for us to really understand the Church’s teaching on Mary’s role and to know what true devotion consists of. I will put enmity between you and the woman, and between your offspring and hers; He will strike at your head, while you strike at his heel. This verse is also a foreshadowing of the ‘woman’ in the book of Revelation who was “clothed with the sun” and “gave birth to a son, a male child, destined to rule all the nations with an iron rod” (12:1, 5). Catholics’ desire to honor Mary is fitting because of her role in the redemption of mankind. 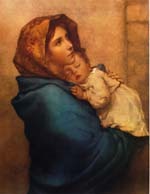 Through her ‘fiat,’ her obedience to the Divine will of God, Mary was overshadowed by the power of the Most High (Lk. 1:35) and became the means by which the Son of God came into the world to redeem mankind and thus became also a cooperator, or co-redeemer with Him. More proof that Mary is intimately linked with the redemptive work of her Son is in the prophecy of Simeon in which he reveals that Mary will also share in the sufferings of Christ. 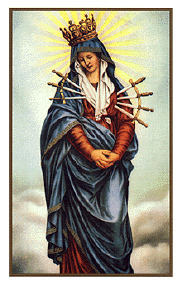 As Christ suffered and died on the cross for our sins, those sins formed the sword that was to pierce the soul of Mary as well (Lk. 2:24-35). It is not the Church who has raised Mary to such a prominent position, but God himself who found favor with her and chose her to be blessed among women (Lk. 2:30, 42). Mary’s obedience undid the disobedience of Eve. For more on this see the Catechism of the Catholic Church n. 494 (which also, by citing the likes of St. Irenaeus, shows that the early Christians believed this as well). Even Mary herself foresaw this devotion when she said in her great Magnificat; “behold, from now on will all ages call me blessed” (Lk. 2:48). We honor Mary, giving her the respect that is owed to such an important figure in Salvation History, one who is, as common sense tells us, the Mother of God. And we devote ourselves to her powerful intercession, a devotion which is, above all, Christ centered, with the goal of achieving perfect union with Him through the help of our Mother in heaven. The same African priest I mentioned earlier explains Mary’s role this way: Two thousand years ago Mary brought Christ into the world; today she desires to bring Christ into our hearts. Hail, Holy Queen: The Mother of God in the Word of God.